I'd call 2015 a productive year for GURPS. After two decades as GURPS Line Editor, I was given approval over new PDF projects and their art. This shortened the pipeline a bit, allowing us to exceed the "one single-author supplement a month" speed limit for the first time since 2012. (You may recall the "GURPS gap" from the end of 2012 to early 2014, which resulted from concentrating on Ogre.) Let's take a look at the results . . . The year's frontrunner was GURPS Dungeon Fantasy. 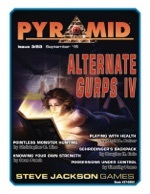 The core series got organized and added GURPS Dungeon Fantasy 17: Guilds. The enemy got stronger -- or at least more disgusting -- thanks to GURPS Dungeon Fantasy Monsters 2: Icky Goo joining the Monsters sub-series. 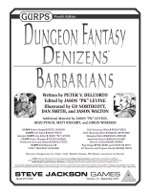 And we launched two new sub-series, with GURPS Dungeon Fantasy Denizens: Barbarians getting the honor of being the first "splatbook" and GURPS Dungeon Fantasy Treasures 1: Glittering Prizes removing any doubt that you can never have enough loot. Not that hack 'n' slash got all the support! Other kinds of power-gamers will appreciate the new magic system in GURPS Thaumatology: Sorcery no matter what flavor of fantasy they like, while GURPS Powers: Enhanced Senses covers superhuman gifts suited to nosy heroes in any genre. 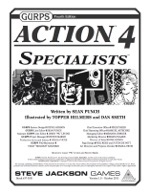 Lovers of over-the-top mayhem set in the "real world" might prefer GURPS Action 4: Specialists and its redefinition of the action hero. And sensitive souls whose campaigns have a social dimension can balance the ultra-powerful and ultra-violent with GURPS Boardroom and Curia (tools for describing organizations) and GURPS Social Engineering: Back to School (a detailed look at teaching and learning). It was also a good year for the not-quite-human. 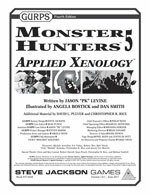 If the extraterrestrial is your thing, you can choose between the furry, mostly friendly race in GURPS Aliens: Sparrials and the scary stuff in GURPS Monster Hunters 5: Applied Xenology. For those who figure that monsters are usually our own creations, there's Transhuman Space: Bioroid Bazaar and Transhuman Space: Bio-Tech 2100 for Transhuman Space. And biotechnology is always just a lab accident away from GURPS Zombies: Day One, which spans every genre mentioned so far. Pyramid supported all of the above, too. If you're into games with a fantastic edge, you'll want to check out #3/75: Hero's Jackpot, #3/76: Dungeon Fantasy IV, and #3/80: Fantasy Threats for killing and looting; #3/78: Unleash Your Soul and #3/82: Magical Creations in general; and #3/81: Horrific Creations if you enjoy a little darkness. Fans of the more futuristic will want #3/79: Space Atlas and #3/85: Cutting Edge. And of course some issues are useful no matter what you're doing, like #3/77: Combat, #3/83: Alternate GURPS IV, #3/84: Perspectives, and #3/86: Organizations. Did you miss any of that? Well, you can buy digital products on Warehouse 23 even while we're on break! "I will be a completist" makes a fine New Year's resolution!